It does come with a one year “warrranty”. The extra “r” is for reliability! That’s right partner. Now is the time to upgrade your PC with the Sundowndisk. Includes controller. Installs right inside your PC in less than 10 minutes. Backed by our full one-year warrranty. But that’s only half the story . . . The Sundown comes loaded with VenturCom Venix/86. This highly-acclaimed operating system is a licensed implementation of AT&Ts UNIX and is the only MULTI-USER, MULTI-TASKING UNIX environment available on the IBM PC. Plus you can store and run your MS/DOS programs and files as well! I notice they quote no prices. I suppose it’s a case of “If you have to ask, you can’t afford it”. Or it was never put into production. I’m always wary when the first hit for a technology item mentioned on this blog is…this blog. But I do like the blood-streaked swoosh lines. VentureCom Venix/86 was indeed an early UNIX port to the PC, and was commercially sold in some form. I’d guess this ad wasn’t entirely vaporous. Well considering UNIX was first implemented on a PDP-7 which was an 18 bit machine (probably a maximum of 256 kilowords), a PC is even larger than what UNIX was intended to run on. 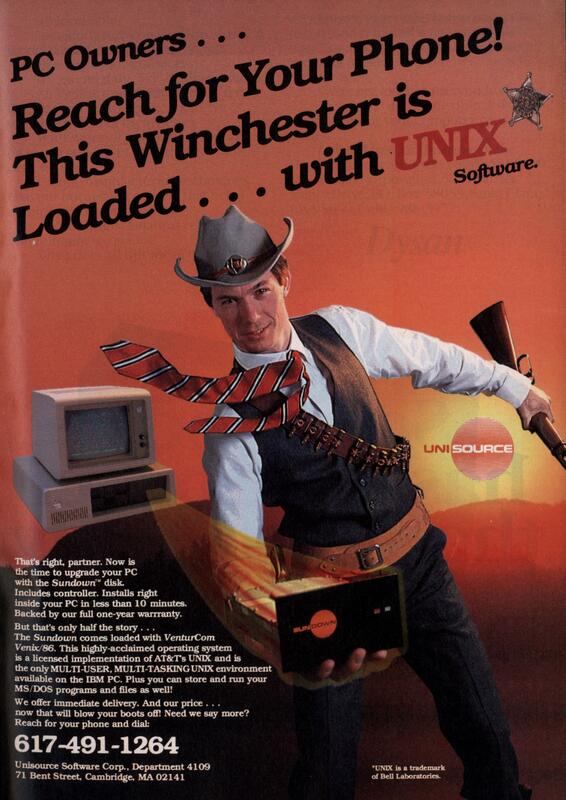 Today it is hard to understand that UNIX used to be very expensive. I read an article from the early 1990s in which they tried “cheap” ways to get some UNIX(ish) system. The standard solution was a Sun workstation, for the price of a car. Apart from that there were cheaper offerings from Atari and the cheapest one Apple Unix from Apple. On many of those products you had to get the TCP/IP Stack separately, which could cost you $200 easily. 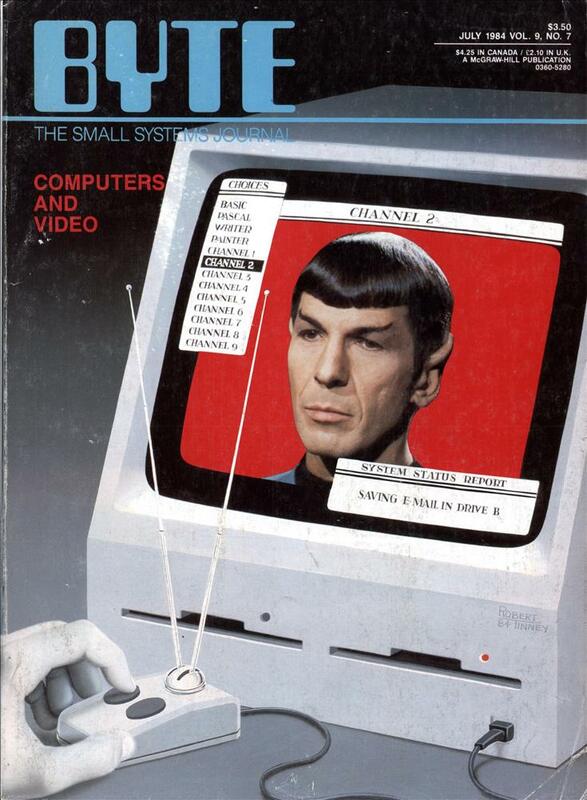 At the end they mentioned the solution for the experimentalist, Minix, the “public domain” UNIX. One of the original designers of UNIX, Dennis Ritchie, passed away in October. His death was over shadowed by Steven Jobs death. Heck, even some commercial UNIX versions charged extra for the TCP/IP software, as late as the 1990s. I remember once buying an old “thicknet” card for an HP-9000 (running HP-UX 7, I think) because it was the cheapest way to get the networking stack I needed to establish a frame-relay link to an existing network in Vancouver. The progress of BSD was hindered by a lawsuit from AT&T. By the time BSD was generally accepted as free and clear, Linux had already taken off. Without that lawsuit, there might not have ever been a Linux. MacOS didn’t even come with a built-in TCP/IP stack until version 7.5.3 in the mid-late 90s, you had to buy one (and a PPP client too) separately. Fortunately every ISP on the planet used to bundle them on their install disks. Unfortunately well into Space Year 2003 the ISP I worked for was committed to support everything from OS7.2 onwards, meaning I still had to cope with really useful error messages like “Shhh don’t tell anyone, but there’s a problem with the TCP stack” from ConfigPPP, the PPP handler we bundled – and that was considered much better than the Apple-approved FreePPP.